We almost missed it … | Me fail? I fly! Rew Hanks’s stunning print featuring Kim Jong-Il scrapes in with an ‘even’ but the Art Student appears in bold and has her image reproduced! Oh the fame, oh the recognition! 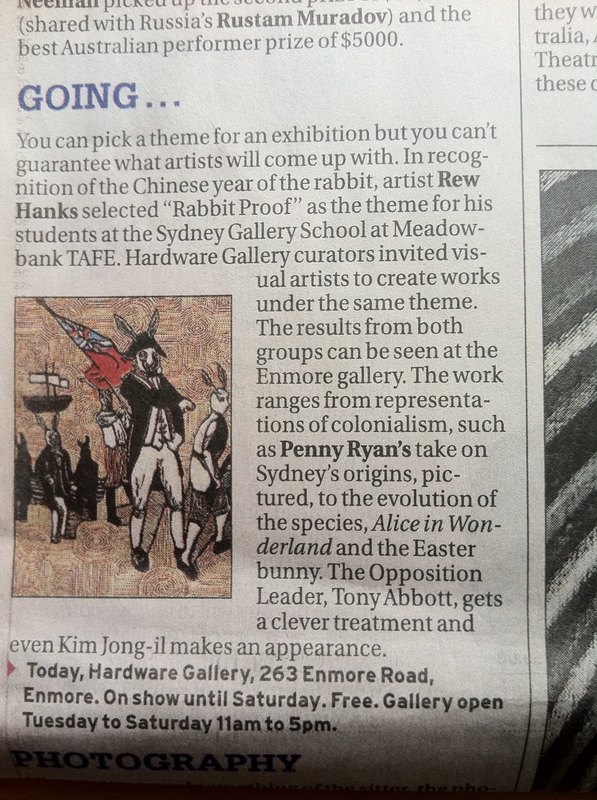 This entry was posted in Vicarious vainglory and tagged Penny Ryan, Rew Hanks, Sydney Morning Herald. Bookmark the permalink. Yes, that ‘student’ part of the name definitely has to go now. Your daughter? Partner? Whatever, good for her. 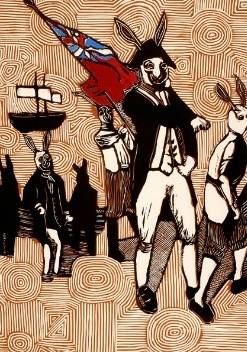 Love the indigenous art looking background, and the use of rabbits is inspired. Partner. She’s in second year at the Gallery School, Meadowbank TAFE. And yes, there’s a tangible anti-whine factor. Oh, and I meant to say that that should take away the whineyness for a while! Well. go her, for both reasons! Thanks, MA. She appreciates it, but won’t write on the blog!